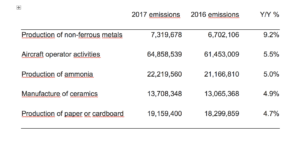 Emissions of open installations in the EU ETS increased by 1.1% in 2017 to 1.821 billion tonnes of CO2. 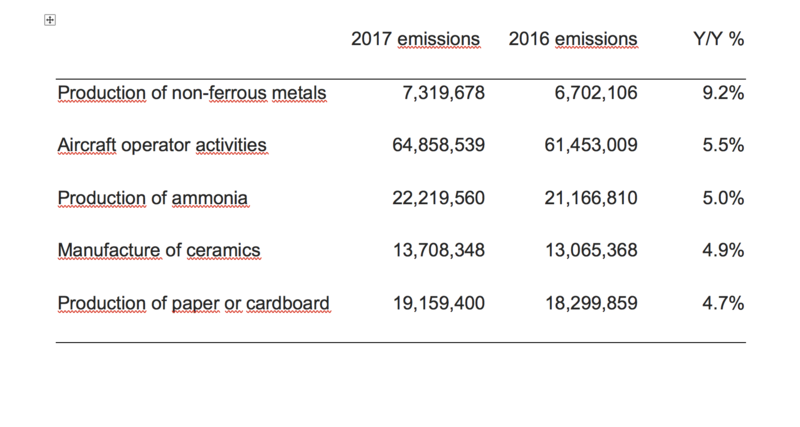 Emissions without aviation reached 1.756 billion tonnes (+1.0% y/y), in line with the market consensus. 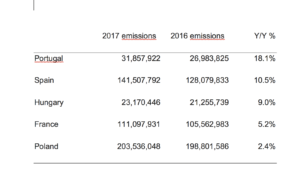 Methodology: when comparing 2017 and 2016 verified emissions, we assumed flat emissions for those open installations that did not report any emissions for 2017. Spain and Portugal posted the biggest increase in their emissions (10.5% and 18.1%, respectively) as low hydro reserves forced utilities to burn more fossil fuels. Central eastern European countries also increased their emissions in tandem with their consolidating economy. The UK (-3.7%) and Germany (-3.0%) were the top emission reducing countries. Both countries had several days in 2017 when the whole power demand of the country could be sourced from renewables. In addition, British utilities are also incentivised to reduce their emissions and to switch fuels by the carbon tax of GBP 18. France saw an unusual increase in its emissions due to the outage of its nuclear capacities that had to be replaced by fossil fuels (mainly gas). Industrial emissions increased by 1.4% on average, while the power sector cut emissions by 1.2%. Aviation emissions increased by 5.5%. The European paper sector increased its emissions by almost 5%. International Paper in Kwidzyn, Poland was the biggest emitter of the sector with 781,456 tonnes of CO2 emitted. On the other hand, Spanish SAICA and Portuguese Soporcel increased their emissions most. 2017 was the first year since 2013, when emissions of installations covered by the European emissions trading system increased. The price posted a marginal gain (+0.2% d/d) on the day of the publication of the data as the increase in emissions was expected. The benchmark carbon contract gained almost 70% since the beginning of the year and 220% since last May. In April, the price hit a seven-year high at 14.22 euro. The compliance deadline ended 30 April. 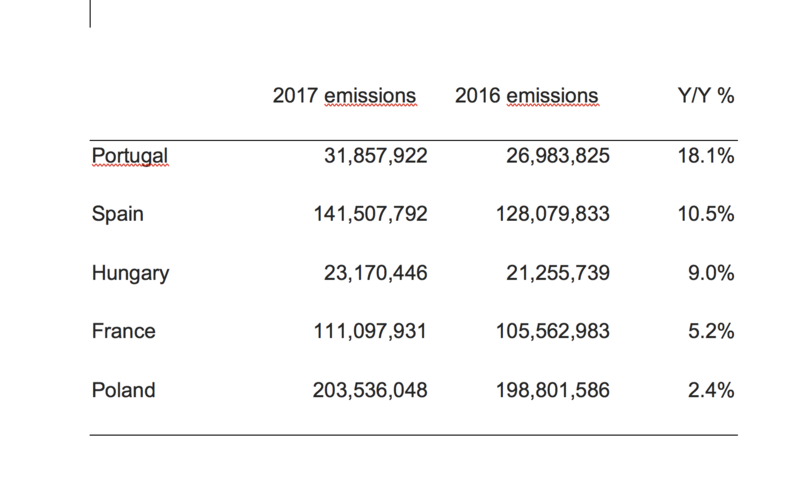 All the companies knew their exact 2017 emissions (as they had to report them until 31 March) and covered the shortage. Many of those installations that did not cover their 2017 emissions last year, were frightened by the price rally in the first quarter of the year and delayed their purchases continuously. In Italy, there were also many installations waiting for the 2018 free allocation to borrow allowances, but due to some delays in allocation they finally decided to purchase their shortage in the market. If an installation fails to purchase and surrender the allowances until the end of April, it risks a fine of 100 euro per each not surrendered allowance (and in addition, it has to purchase the EUAs and surrender them). 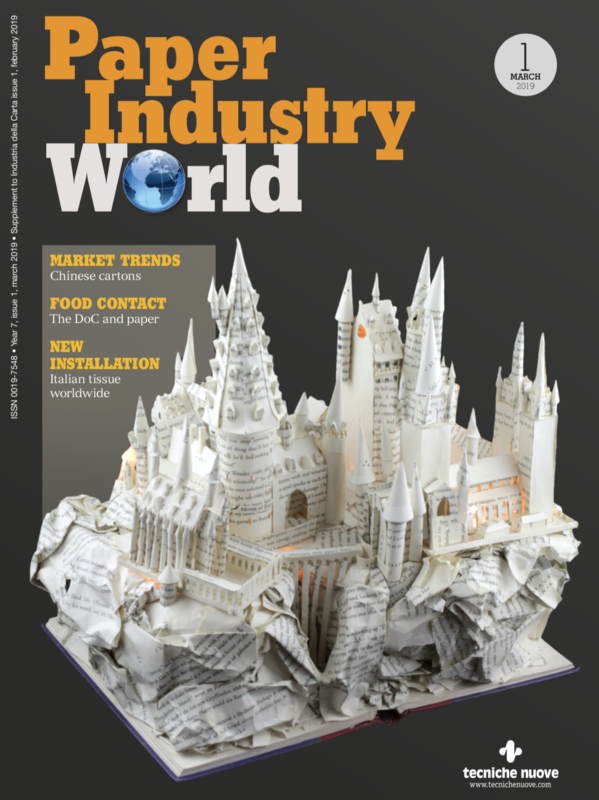 Industrial installations are recently afraid of lower free allocation in the future. The rules of free allocation will be significantly stricter in Phase 4 when they are recalculated based on new (and declining) benchmarks, reviewed production levels and shortened carbon leakage list. They do therefore not borrow allowances from next year’s allocation, but purchase them in the market. In addition, industrial installations that had a surplus in the last years accumulated during the financial crisis are running out of their extra allowances and have to turn to the market to buy allowances. They do not appear on the sellers’ side at all (see the previous bullet point). It is difficult to find sellers these days and buyers are just running behind the offers. One reason for speculation is that all the reforms that will tighten the supply from next year (and in Phase 4) have been approved. The market stability reserve will have the double feed rate than the original proposal of the Commission AND approximately 2 billion allowances will be cancelled in 2023. These measures affect the auction supply, but free allocation for industrial installations will be also reduced. Other reason for speculation is that EUA became financial instrument in January 2018 (due to MiFID II), and are appealing for hedge funds to diversify their portfolio. If they check the chart, they realise that the carbon price moves in an increasing trend since last May. As these are financially strong companies, even by investing just a fraction of their money they can lift the carbon price significantly.